1. Melt some butter in a frying pan over medium-high heat. 2. Apply a layer of peeled shrimp. When half-cooked, turn over and continue frying until translucent (about 3 minutes). Then remove shrimp to a plate. 3. Cut the onion into small cubes and finely chop the garlic. Return the pan to the heat, pour in the ingredients and sauté until the onions become translucent. 4. Lower the temperature to low to moderate, add the Arborio rice to the pan and cook for 2-3 minutes, stirring and being careful not to scorch. Then add the white wine and wait for a few minutes, continuing to stir until absorbed. 5. Gradually add the vegetable broth –which you have previously heated in a pot– stirring every now and then and wait until it’s absorbed by the rice. Until then, squeeze the lemon, adding some juice into the pan. Also add salt and pepper. When the rice is ready (try and see if it is tender enough), you can optionally add a little lemon zest at the end of cooking. 6. 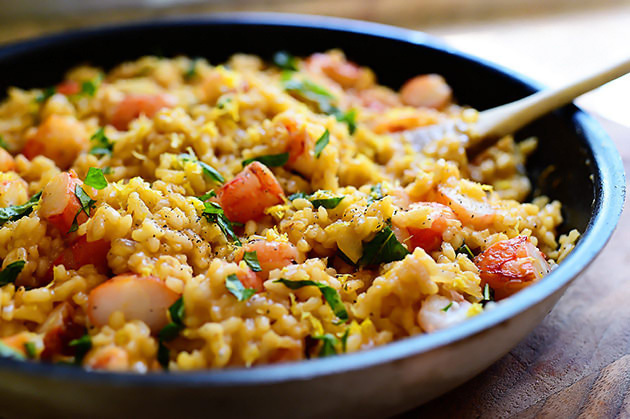 Now it’s time to take your risotto to the next level! Add the sour cream and stir well. Of course you can skip this step if you don’t want the food to be very heavy. 7. If shrimp is large enough, cut into pieces. If it’s small, it’s not necessary. Coarsely chop the basil and add it along with the shrimp to the risotto. Mix all ingredients and, optionally, add extra lemon zest and pepper and sprinkle grated parmesan.